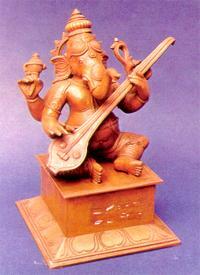 The little mouse which is seen as the mount of Ganesha is the most enigmatic figure in his image or picture. Just as the English word cow a domestic animal which gives milk got mixed up with the sanskrit mystic word 'Gao' the word mouse in English also got mixed up with another sanskrit mystic word Mushika. The mouse which lives in its burrow throughout the day shunning, sunlight was associated in ancient Egypt with all mystic rites. It was in spite of its apathy for sunlight dedicated to Horus the Sun God and was considered as an external manifestation of the soul which lives inside the body. It was kept in temples as a sacred animal and when it died its body was mummified and preserved. Herodotus says that in the Temple of Hephaestus in Egypt there is a statue of an Egyptian King with a mouse in his hand with the words "Look on me for the Gods." In some Ganesha temples in India also even at the present time mice are kept and fed with milk and sweet meat and they move about without fear. From Egypt the cult appears to have spread to Greece and Rome where also mice were held as sacred animals, fed and kept in temples and other religious sanctuaries. In the Old Testament of the Bible there is the reference of a trespass offer of five Golden mice by the Philistines a non-semitic race, to the Israelites for the wrongful detention of their Ark containing the sacred rolls. This trespass offer is an illustration of the usage of Golden mice having the colour of pure gold for expiatory purposes. Pure gold is called in India as 'Musa Gold'. The crucible used for melting gold is called muz. The burrow where the golden mouse lives is also called muz and that is why it is called in Sanskrit 'Mushikam' a word derived from Muz which got into the English vocabulary as mouse. Mice like serpents are shunned as loathsome creatures. But like serpents they attained considerable mystic significance. It is in keeping with this, a tiny mouse is seen carrying the heavy weight of Ganesha.